Volkswagen has released the first details of the powerful new 2014 Golf R, which will debut at the 2013 Frankfurt Motor Show in September. 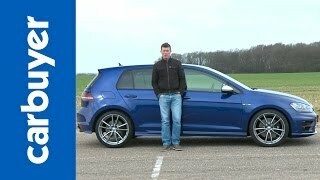 The new Golf R rides on specially tuned springs and dampers than lower the ride height by 20 mm. It is equipped with progressive steering, a new front bumper with large air inlets, modified grille with ‘R’ logo, new daytime running lights and 18-inch alloy wheels with black-painted brake calipers with ‘R’ logos. On the rear there are smoked LED tail lights, and ‘R’ diffuser and four chrome-tipped exhaust pipes. 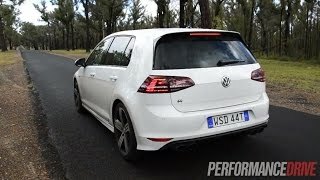 The 2014 Volkswagen Golf-R is powered by the turbocharged 2.0-liter four-cylinder engine developing an impressive 300PS from 5,500 rpm to 6,200 rpm and a 380 Nm (280 lbs ft) of torque. It transfers the power to the road via the latest 4MOTION four-wheel drive system. 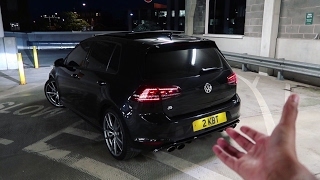 The new Golf R is the fastest-accelerating production Golf yet, with a zero to 62 mph time of just 5.3 seconds or 4.9 seconds when fitted with the optional six-speed DSG gearbox. Top speed is electronically limited to 155 mph.